THE three directors of a Blackpool firm specialising in the building of racing bicycles; proudly display one of their products, an £800 exhibition model. Dennis Hill, Harry Howe and Brian Addison have been manufacturing their “Hill’s Specials” from a small workshop in Charles Street since last April, and already orders are pouring in from abroad, as well as from Britain’s own racing champions. But after last week’s news that one major bike manufacturer has succumbed to the recession how come this company is taking off? DAVID MOFFATT went along to find out. WHEN you’re cycling up slopes steep enough to make the average mountain gazelle falter, every ounce of your strength – and your bike – counts. That was the weighty problem which former Great Britain cycling international Dennis Hill knew only too well when he joined the new racing cycles division of the Harbri Engineering Company, Blackpool. 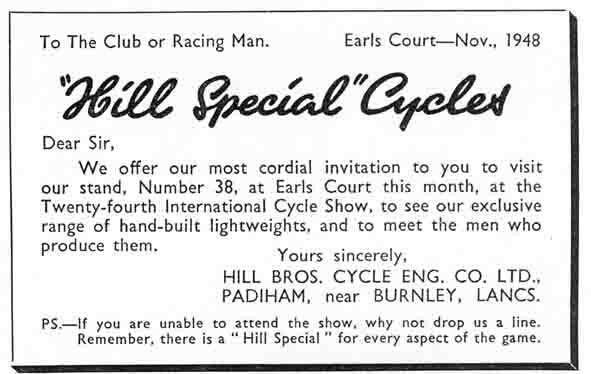 “Hill’s Specials” were the result – lightweight cycle frames for all aspects of the sport, road racing, pursuit racing and time trials. But, with one major bike manufacturer laying off several hundred workers last week, was the move a wise one? “It’s true there’s a slump in the larger stores for bikes, but there are quite a few small firms producing custom – built bikes who are doing very well,” said Mr Howe. The show got on the road in April and since then orders from as far afield as Dubai, Australia and New Zealand have arrived at the Charles Street workshop. “Hill’s Specials” are custom – built frames light enough to be pulled along thousands of miles of road by ever – wearier legs, resilient enough to withstand the sudden lurch forward in sprint competition. The acid test for them will come in March when the racine season starts. 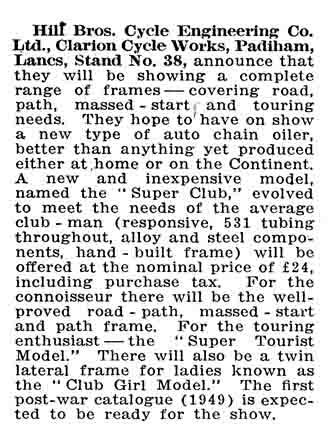 Several frames have already been sold to competitive cyclists including road racer Tim Schools; Bob Barlow for the forthcoming police championship; and Harry Hill, star of the 1936 Olympics who is making a comeback in veteran racing. One of them, frame – builder Roger Kowalski, has sweated over bikes, in and out out the saddle, for more than 40 years. In his vast experience for several cycling companies he has built for the sport’s great names — Reg Harris, Beryl Burton and Norman Shiel. “A frame is like a work of art and like the artist the builder must have that special gift in his blood,” he says. Since April the firm’s four frame-builders have turned out 120 frames tailored exactly to the individual rider’s personal measurements. Each one takes two days to produce and costs £203. Weight is cut to a minimum and the average roadracing frame tips the scales at 14lb. One of the apprentices currently learning the trade is 16 year-old Stephen Vaselli. Hanging above him in the workshop is a frame he has just built, as yet unpainted and without handlebars or wheels. But in February, Stephen, a champion junior cyclist will be able to see just how good his handiwork is . . . he’ll be riding the bike in a competition! To modify a cliché, life has come full cycle for 72 – year old Mr Adam Hill, of Devonshire Road, Blackpool. At a time of life when most people might be concerned more with carpet slippers, or at least a gentler way of living, Mr Hill is turning again to the demanding treadmill of industry. 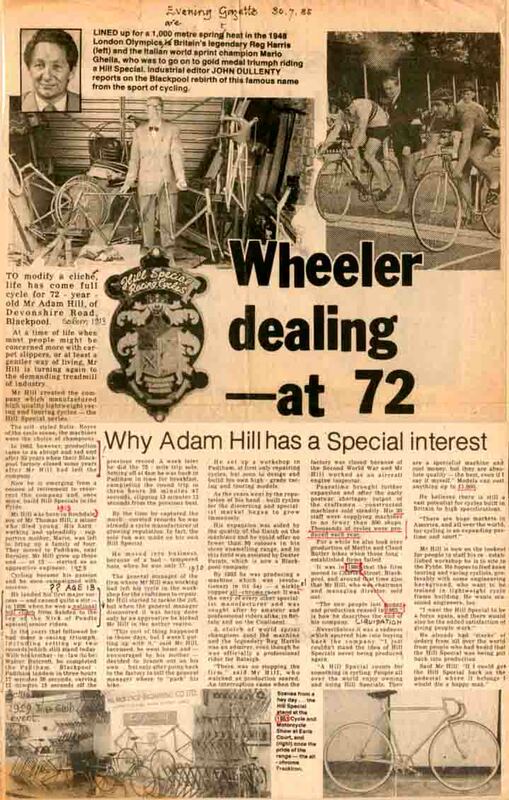 Mr Hill created the company which manufactured high quality lightweight racing and touring cycles – the Hill Special series. The self – styled Rolls – Royce of the cycle scene, the machines were the choice of champions. In 1983, however, production came to an abrupt and sad end after 53 years when their Blackpool factory, closed some years after Mr Hill had left the company. Now he is emerging from a cocoon of retirement to resurrect the company and, once more, build Hill Specials in the Fylde. Mr Hill was born in Rochdale, son of Mr Thomas Hill, a miner who died young. His hard working and splendidly supportive mother, Marie, was left to bring up, a family of four. They moved to Padiham, near Burnley. Mr Hill grew up there and – at 15 – started as an apprentice engineer. Cycling became his passion and he soon campaigned with success. He landed his first major success – and caused quite a stir – in 1926 when he won a national hill climb from Sabden to the top of the Nick of Pendle against senior riders. In the years that followed he had many a racing triumph, including setting up two records which still stand today. With his brother – in – law (to be) Walter Holcroft, he completed the Padiham – Blackpool – Padiham tandem in three hours 17 minutes 36 seconds, carving 12 minutes 15 seconds off the previous record. A week later he did the 75 – mile trip solo. Setting off at 4am he was back in Padiham in time for breakfast, completing the round trip in three hours 36 minutes 47 seconds, clipping 13 minutes 12 seconds from the previous best. By the time he captured the much – coveted records he was already a cycle manufacturer of growing reputation. In fact, the solo run was made on his own Hill Special. He moved into business, because of a bad – tempered boss, when he was only 17. The general manager of the firm where Mr Hill was working had left his cycle in the workshop for the craftsmen to repair. Mr Hill started to tackle the job, but when the general manager discovered it was being done only by an apprentice he kicked Mr Hill in the nether region. “This sort of thing happened in those days, but I wasn’t putting up with it,” said Mr Hill. Incensed, he went home and – encouraged by his mother – decided to branch out on his own . . . but only after going back to the factory to tell the general manager where to “park” his bike. He set up a workshop in Padiham, at first only repairing cycles, but soon to design and build his own high – grade racing and touring models. As the years went by the reputation of his hand – built cycles for the discerning and specialist market began to grow immensely. His expansion was aided by the quality of finish on the machines and he could offer no fewer than 80 colours in his stove enamelling range, and in this field was assisted by Dexter Paints, which is now a Blackpool company. By 1933 he was producing a machine which was revolutionary in its day – a nickle copper all – chrome racer. It was the envy of every other specialist manufacturer and was sought after by amateur and professional riders alike, in Britain and on the Continent. A clutch of world sprint champions used the machine and the legendary Reg Harris was an admirer, even though he was officially a professional rider for Raleigh. “There was no stopping the firm,” said Mr Hill, who watched as production soared. An interruption came when the factory was closed because of the Second World War and Mr Hill worked as an aircraft engine inspector. Peacetime brought further expansion and after the early postwar shortages output of the craftsmen – constructed machines sold steadily. His 30 staff were supplying machines to no fewer than 500 shops. Thousands of cycles were produced each year. 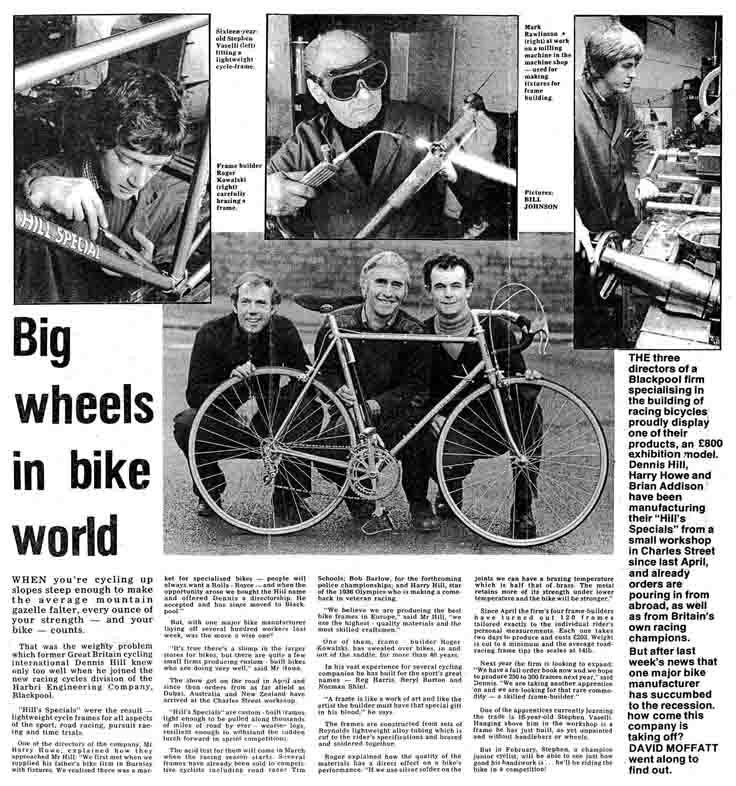 For a while he also took over production of Merlin and Claud Butler bikes when those long established firms failed. It was in 1980 that the firm moved to Charles Street, Blackpool, and around that time also that Mr Hill, who was chairman and managing director, sold out. “The new people lost money and production ceased in 1983,” is how he describes the end of his company. Nevertheless it was a sadness which spurred him into buying back the company. “I just couldn’t stand the idea of Hill Specials never being produced again. “A Hill Special counts for something in cycling. People all over the world enjoy owning and using Hill Specials. They are a specialist machine and cost money, but they are absolute quality — the best, even if I say it myself.” Models can cost anything up to £1,000. He believes there is still a vast potential for cycles built in Britain to high specifications. Mr Hill is now on the lookout for people to staff his re – established workshop he is to site in the Fylde. He hopes to find keen touring and racing cyclists, preferably with some engineering background who want to be trained in lightweight cycle frame building. He wants seasoned engineers, too. He already had “stacks” of orders from all over the world from people who had heard that the Hill Special was being put back into production.